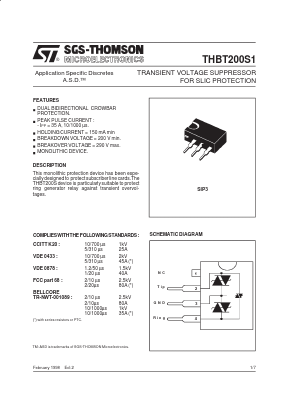 This monolithic protection device has been especially designed to protect subscriber line cards.The THBT200Sdevice is particularly suitable to protect ring generator relay against transient overvoltages. â DUAL BIDIRECTIONAL CROWBAR PROTECTION. â PEAK PULSE CURRENT : - IPP = 35 A, 10/1000 Âµs. â BREAKDOWN VOLTAGE = 200 V min. â BREAKOVERVOLTAGE = 290 V max.